What Are Common Children’s Dental Problems I Need To Watch Out For? Your child’s teeth haven’t been in their mouth for very long. But they still face many of the same dental issues as grown adults. It’s important not only to take your child to the dentist as soon as their first teeth come in. But it’s also important that you keep an eye on their teeth as well. 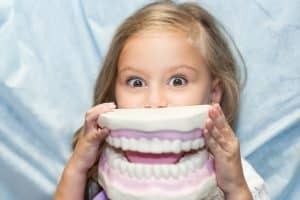 What dental problems could my child be facing? The sooner you and your child’s dentist are able to identify problems, the more you’ll be able to spare your child any unnecessary pain. That said, here are some of the most common dental problems seen in children to help you stay prepared. Tooth decay. Tooth decay is caused by bacteria and plaque acids, which attack and destroy your child’s tooth enamel. Be sure to pay close attention to your child’s oral hygiene and their diet. Also, be sure not to let your child fall asleep with a bottle in their mouth. The sugars from the milk could be feeding the bacteria. Gum disease. Gum disease is an inflammation of your child’s gum tissue, which is caused by ineffective oral hygiene. Misalignment. Your child’s teeth are just beginning to come in and they may be misaligned as they appear. Misalignment can sometimes be caused by thumbsucking. Anterior open bite. This is when your child’s molars come together, but the front teeth don’t. Posterior crossbite. This is when your child’s molars underbite and their front teeth overbite. This causes a misalignment throughout your child’s entire mouth that crosses over at the canine teeth. Anterior excessive overjet. This is when your child’s front teeth significantly overhang their other teeth in an overbite. Where can I find thumb sucking guards that work? Thumbsucking has been known to cause speech impairments in children. In fact, up to 5% of children will experience a speech disorder by the first grade. If you’re looking for a thumb sucking guard to help your child stop finger sucking, T Guard has what you need. Our TGuard classic is made of a soft plastic material that deters the sucking sensation that makes thumb sucking a bad habit. To learn more about our thumb sucking deterrents, contact T Guard today.